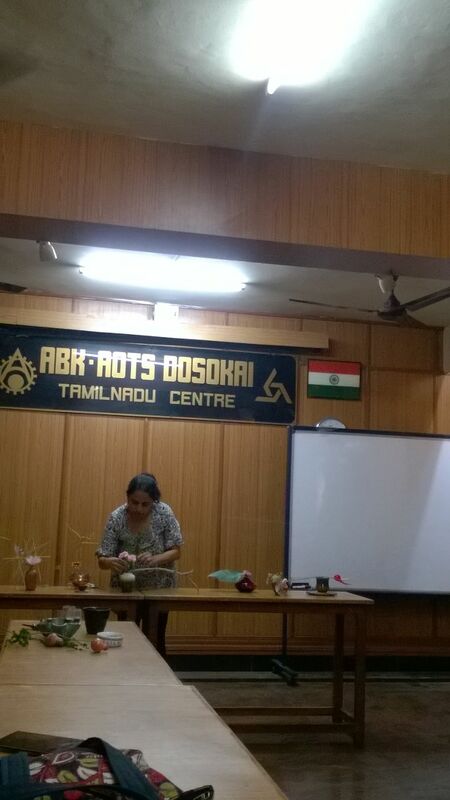 The November 2016 demo and workshop in the ABK premises was well attended, with 12 members present. 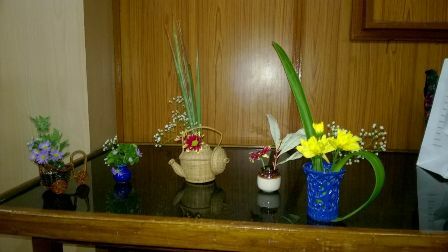 The theme of the day was miniature arrangements. 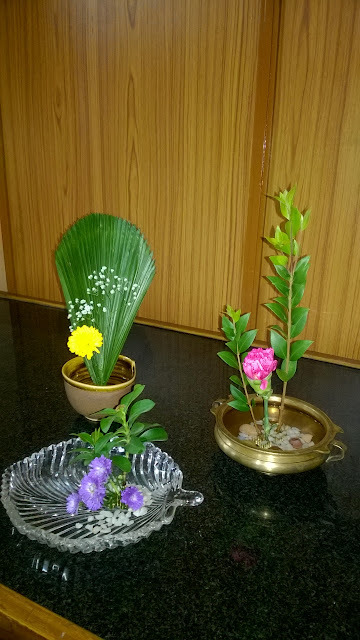 Sensei Malathi mentioned that miniature style was a favourite of Kasumi Teshigahara. 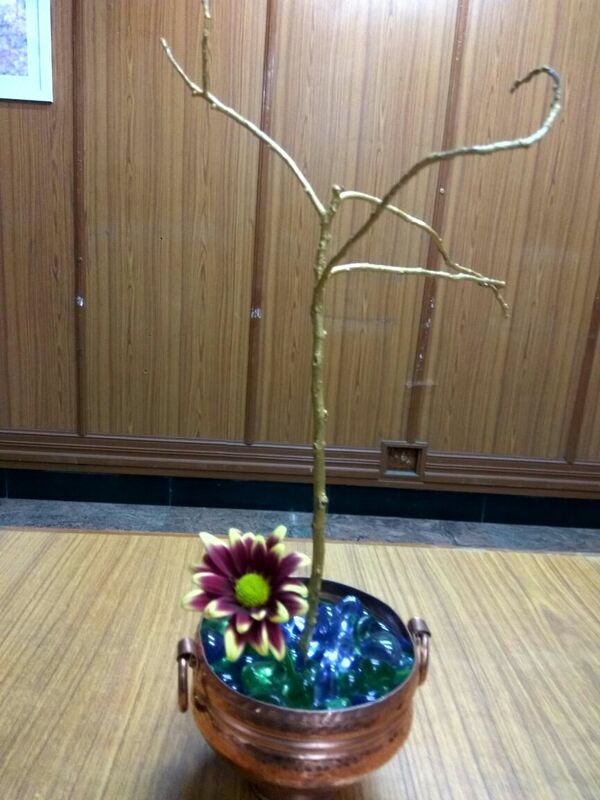 It is a very personal style, from the heart and ideal for personal spaces like dressing tables, desks and so on. 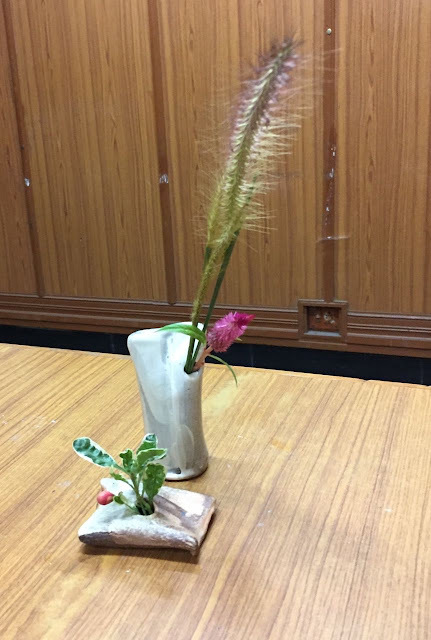 Sensei Prerana gave a demo on Miniatures and shared her experience of attending a class with Mr. Christopher Lim in Singapore earlier this year. She said that was her first exposure to miniatures, and enabled her to gain a proper understanding of this. 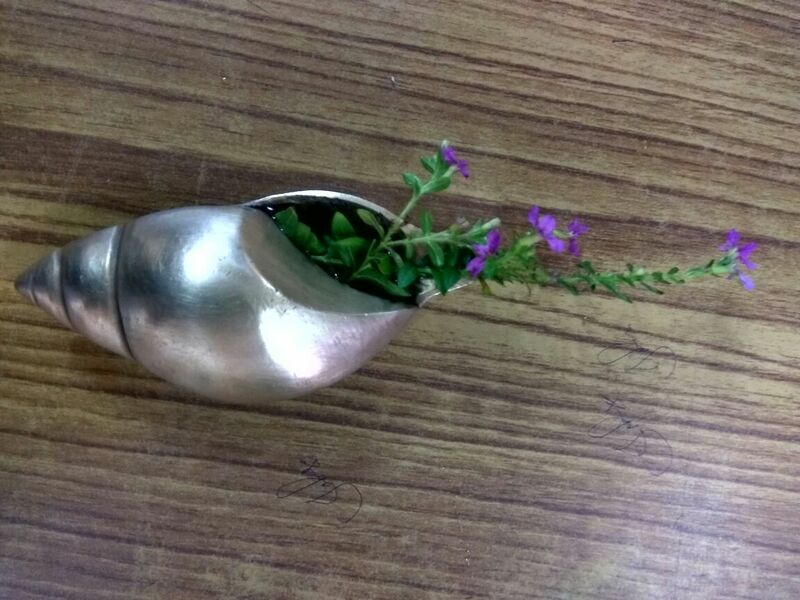 The key points are that the container should be small enough to fit into one’s palm, and the materials used should not be overpowering. 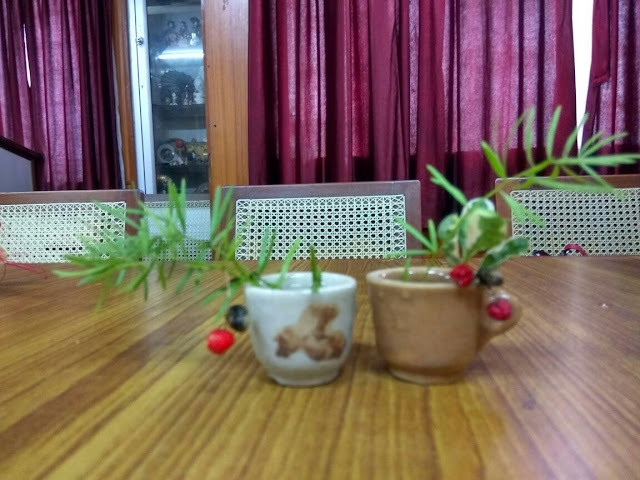 It should be possible to make the same arrangement on a larger scale. 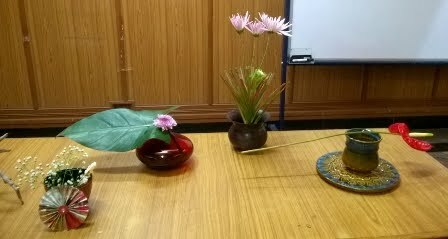 Sensei Prerana did ten arrangements with a variety of vases and flowers, each one a beauty to behold and conveying her energy and creativity. 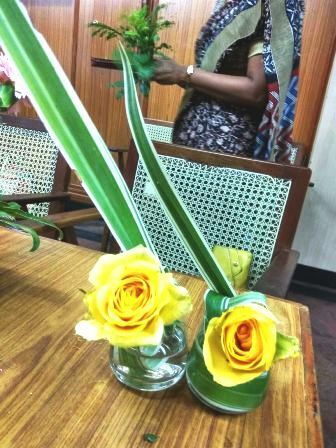 Her vibrant narrative and efficient work kept us engrossed, like a drama unfolding on stage. 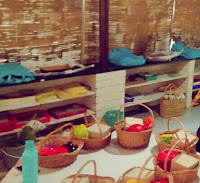 Prerana used the materials to maximum effect and created a spectrum of styles from shy, delicate to bold and energetic. 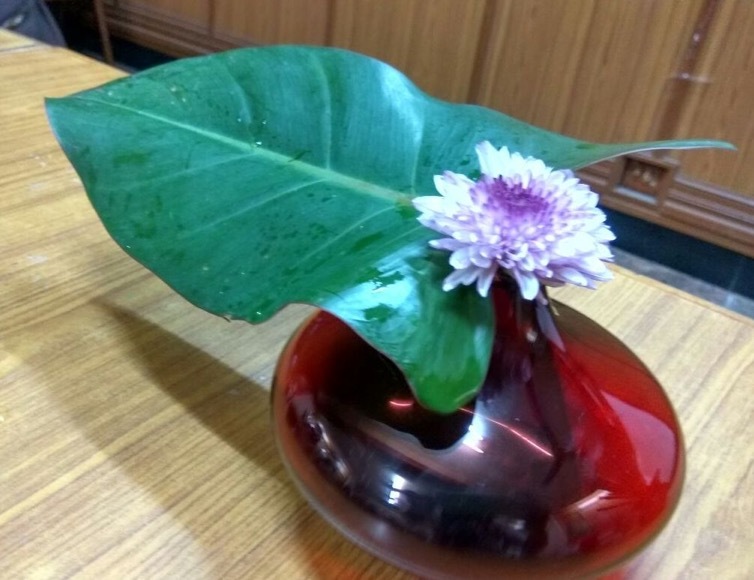 Sensei Prerana used a single red anthurium to add colour to the aesthetic vase and base that were beautiful on thier own. 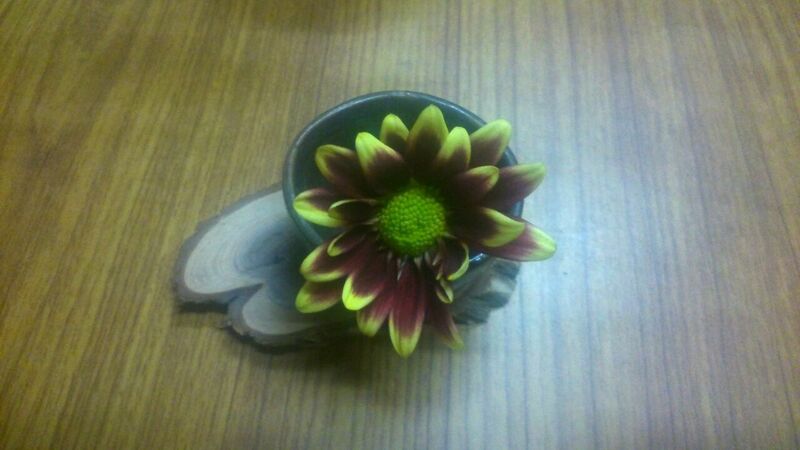 The perfect miniature, using a diya and a single flower with a tiny wooden base. The workshop on the same theme was equally engaging and everyone presented unique and appealing pieces. The air of seriousness was akin to an exam and at the end, a joy to see the completed miniatures. 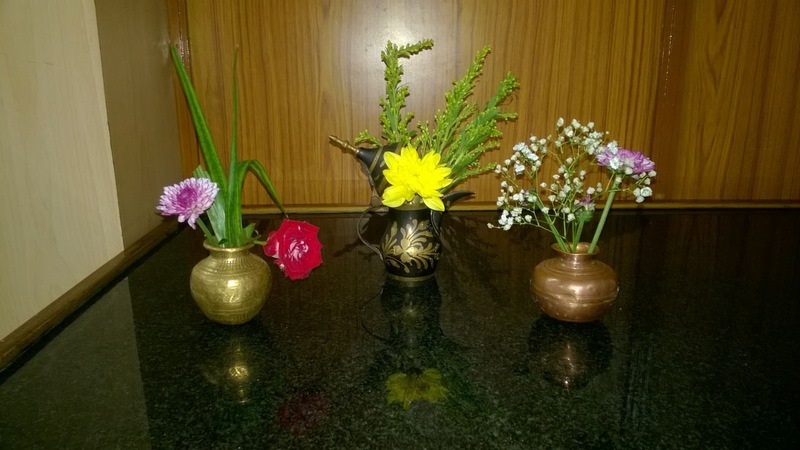 The variety of vases and other objects deftly used as containers was an eye opener. 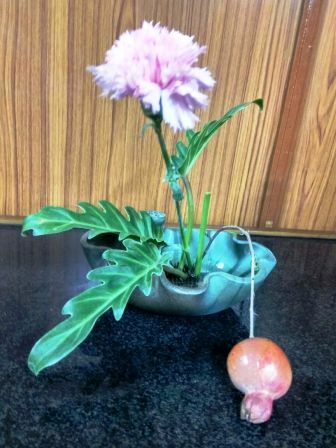 Divya chose a tiny pomogranate from her garden for this composition in a blue-green ceramic vase. 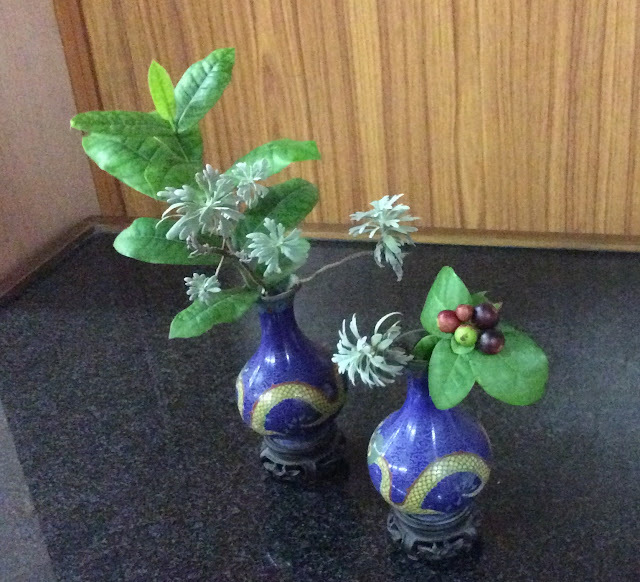 Malathi sensei used twin ceramic vases that stood out with ixora leaves, berries and a hint of lavender. 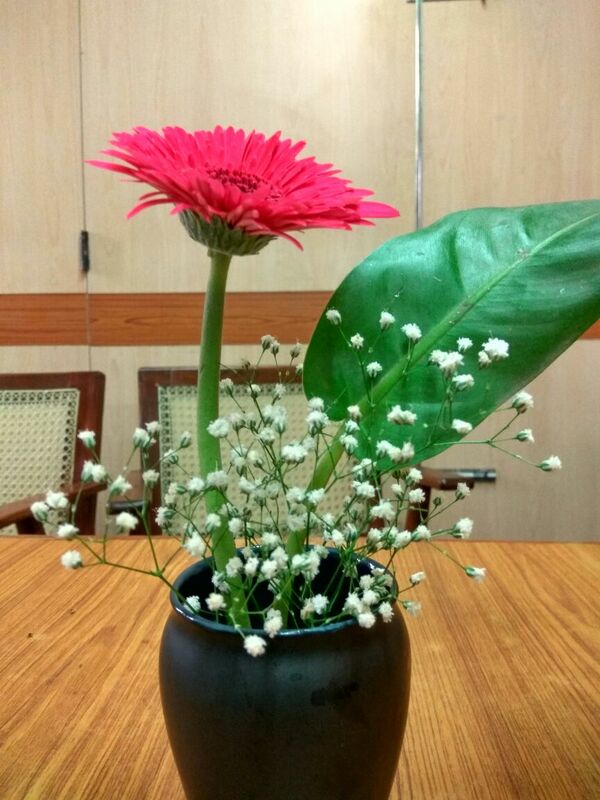 Pink zerbera was a perfect choice for Roopa, to go with this black vase, with a single green leaf and gypsophilia. Sensei Trishala created a fairytale effect with pretty colours and a unique woven coffee pot that reminds her of relaxed mornings with hot coffee. 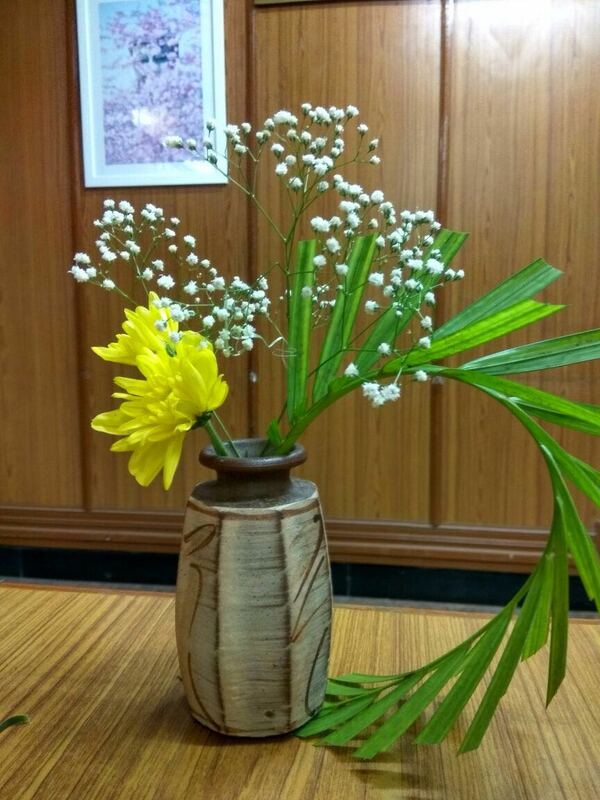 Minimal use of materials highlight the vases. ...as well as these coffee cups with complementary colours. 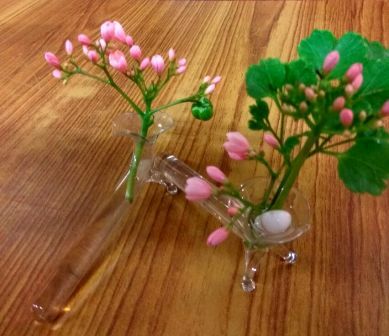 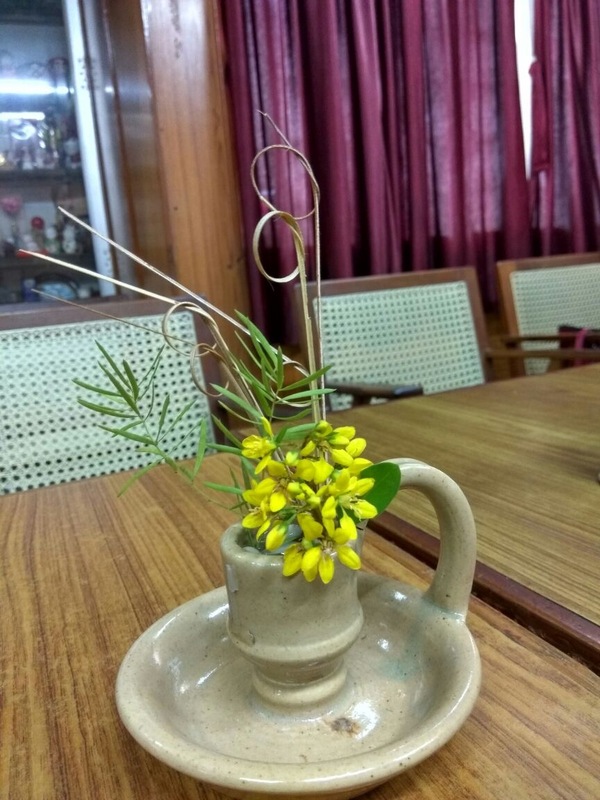 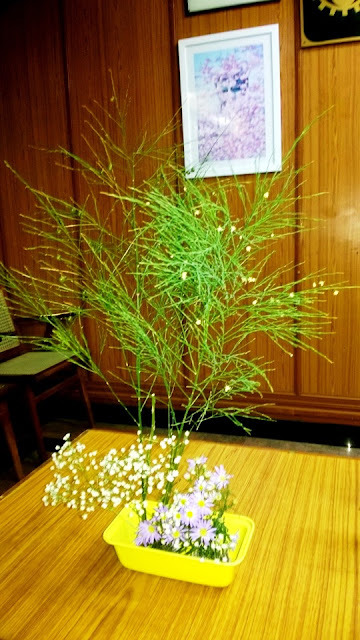 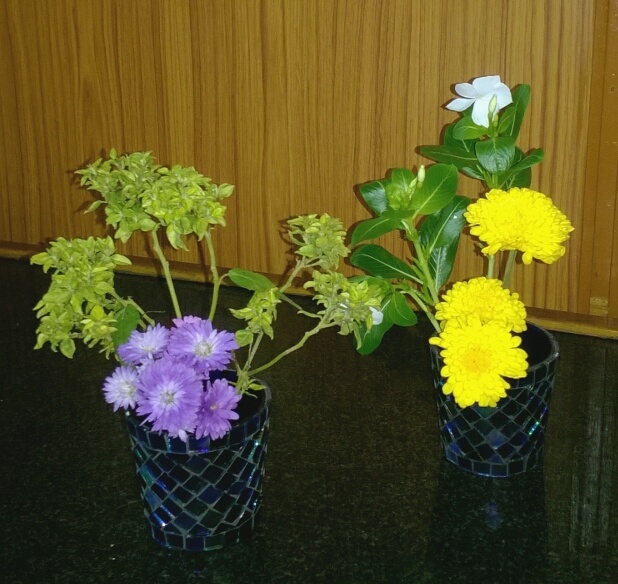 Sensei Janaki has begun a Ikebana workshop for children, and here is her account of it. The workshop started on October and will go on until December. 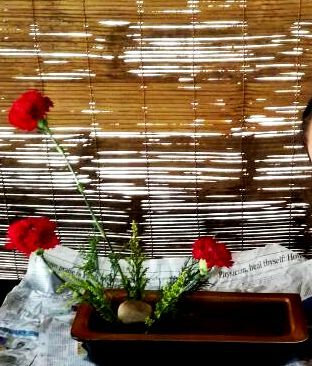 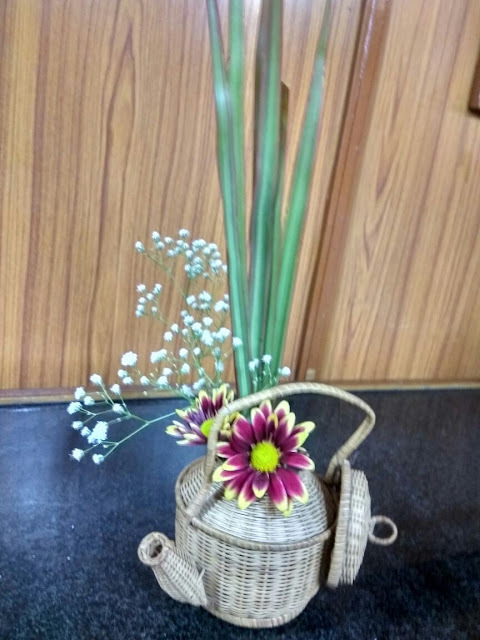 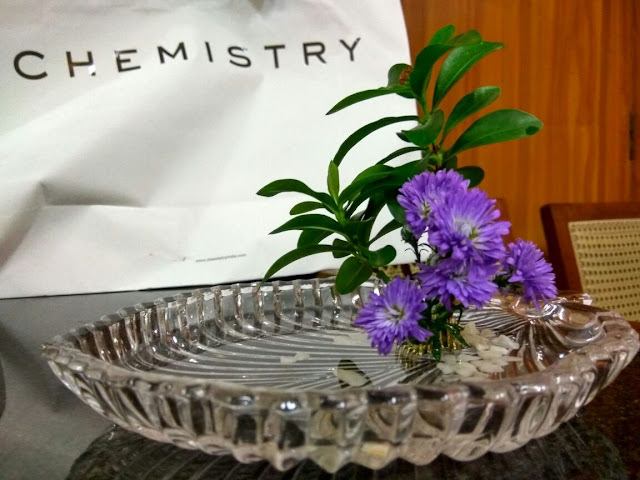 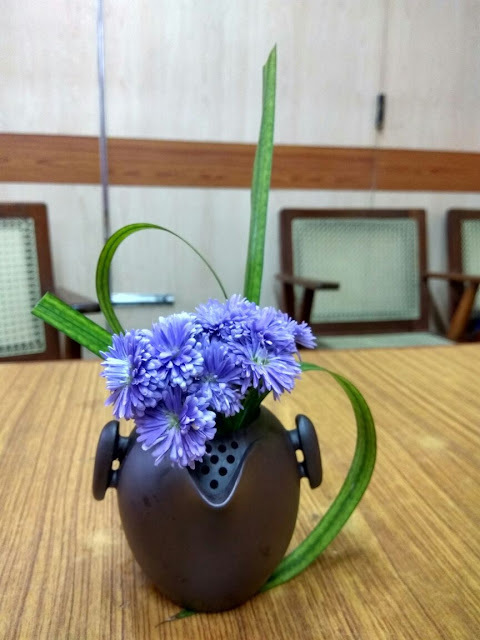 "A casual mention that I am an Ikebana teacher got the attention of my dear friend Mrs. Bhavani Kumar who runs Patasala Montessori School in Chennai. 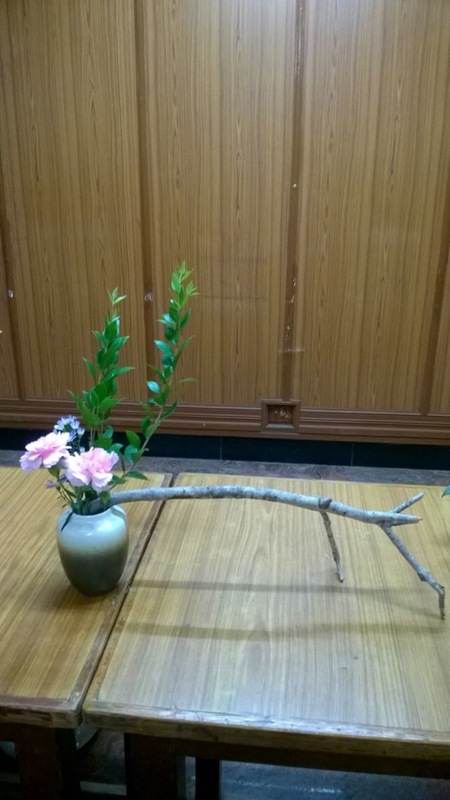 She had been looking for someone to conduct floral based activities for children and thought introducing children to Ikebana would fit the bill. 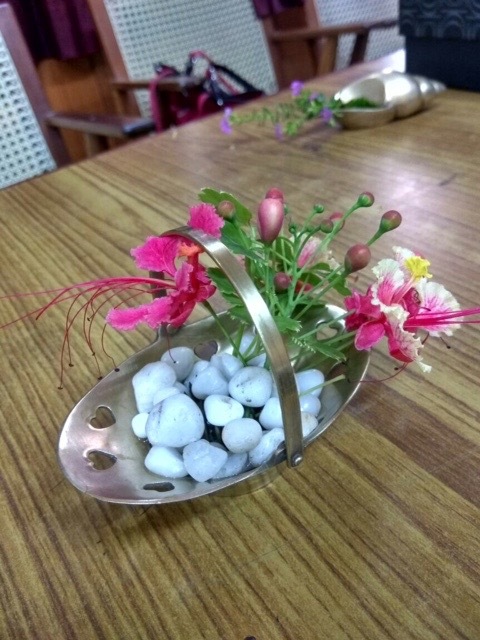 This program is part of a series of life skill workshops that encourage the work of the hand. As Maria Montessori said: "The hand is the tool for intelligence". 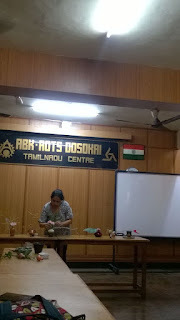 These workshops usually involve learning skills that are useful in daily life. 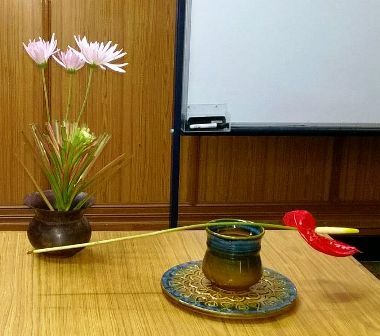 The school invites passionate resource people to come in and share their expertise. 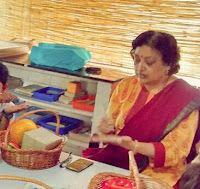 In the end the children absorb more of the passion and inspiration than the techniques themselves. A couple of months of planning and preparation and the workshop took off on October 21, 2016, with seven students of age 7 to 10 years. It is spread over eight sessions, every Friday from 1 to 2.30 pm. 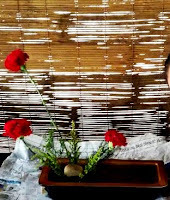 The children have their own complete kit of suiban, a small vase, cutters, floral foam, a bowl, water tubes, napkin, and a cane basket to keep all the things in, besides introductory notes. 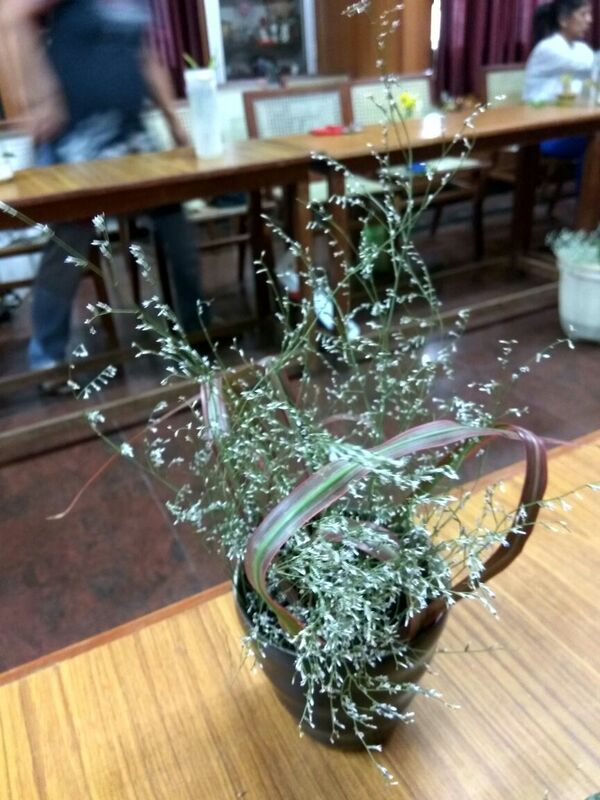 The highly interactive workshop includes an introduction to Ikebana, basic upright and slanting styles as well as lessons on using different containers and material, and for festive occasions. 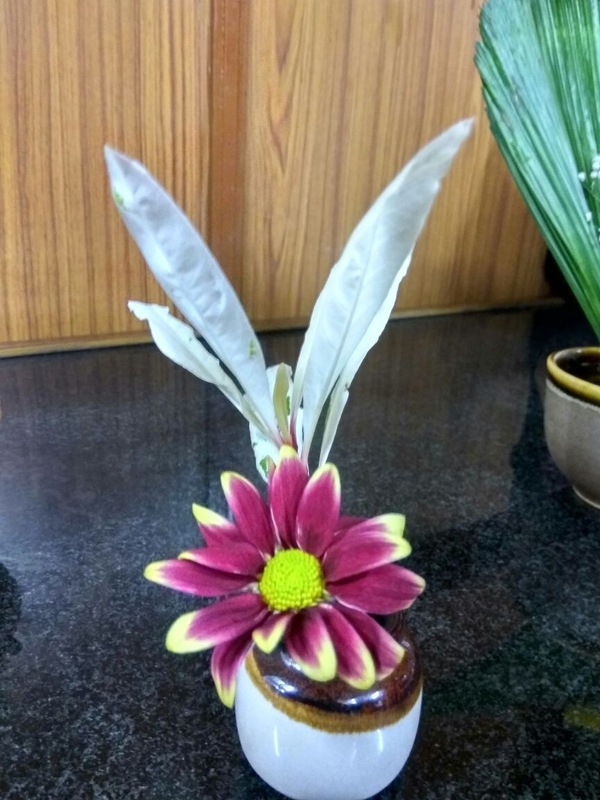 Each session comprises a demo of the day’s lesson; children will then do a piece on their own and record their observations either in writing or drawings. 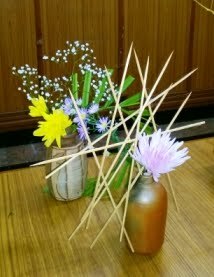 The concluding session will see children making their own piece independently and open to parents to view them. The students’ curiosity, quick perception and learning skills are amazing. 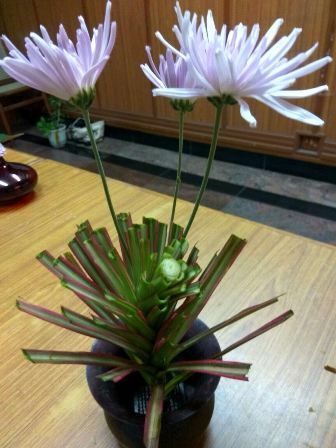 Even as I began on my piece, they observed that the stems formed a triangle at the base as well as at the top. The calmness and natural look of the piece appealed to them, and even said it resembles a pond and colourful plate of food –think Masterchef! 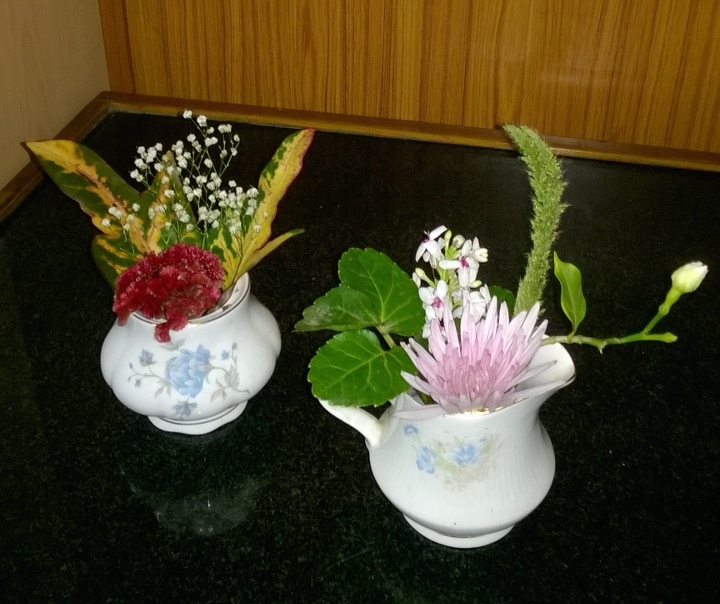 The joy with which they participate is infectious and inspiring. 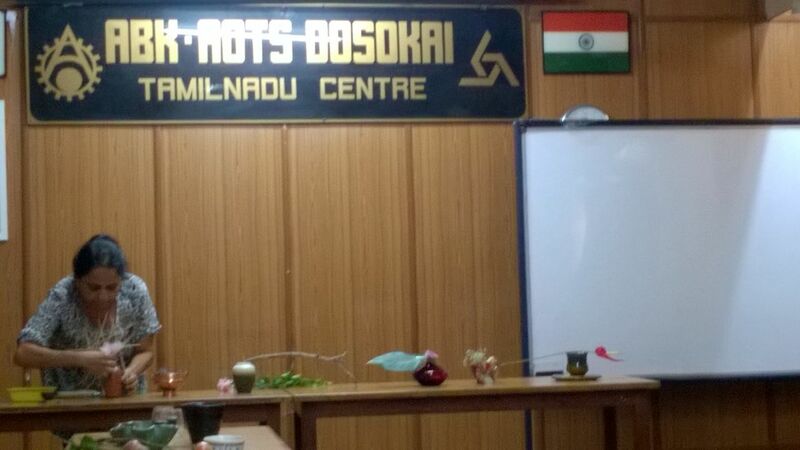 Many thanks to Bhavani and the school for this opportunity. 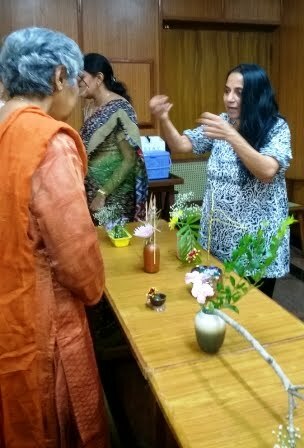 Looking forward to many more such events and many thanks to Malathi sensei and all my Ikebana friends for their guidance and support."